Facebook recently announced the removal of fan gates – the mechanism that forces people to like a page in order to enter a competition or access content. In the early days, when organic reach was high, building a big fan base was important – and the quickest and easiest way of doing this was by running a fan gated competition. Brands filled their communities full of people who didn’t care about their business – they just wanted to win prizes. And that was fine – because back then organic reach was high so this gave brands a massive audience to broadcast branded messages to. Then algorithm changes made organic reach more difficult to come by, shifting the focus from likes to engagement. The only problem was brands had filled their communities so full of unengaged fans that their engagement metrics looked awful – and they started to wonder if Facebook was the right platform for them. The question really is: are you the right business for the Facebook platform? Facebook is NOT an owned channel. Brands don’t own their fans, their page or the platform. Facebook changes the rules to ensure the platform remains relevant and useful to their 1.1 billion users, not to suit brands. After all, isn’t that why brands are there? It’s time to stop thinking about Facebook as an owned channel and start thinking about it as an earned channel. Strategy. Understand what the business needs to achieve and how they will be measured. Know what conversations you want to have, what tools you have to bring them to life with and what you want to achieve with each and every post. Then build a reporting template that benchmarks these objectives over time. Content. Facebook is a content-hungry platform requiring a constant stream of great content and conversations. Focus your budgets on good, creative ideas – because a good idea can be brought to life quickly and cost effectively using any one of the hundreds of online tools that filter photos, create infographics or short videos. Community Management. Get a good community manager – someone who understands social media, but also marketing, branding, communications and customer service. And someone who has the time to monitor every comment and respond to every wall post or private message in a timely manner. Paid Media Support. How much media support is needed depends on how well the three steps above have been done. Having a clearly defined strategy and investing in good content and community management will have a loyal, engaged community that requires only a small paid media investment. In addition, understanding the Five Audiences of Facebook and how to engage with them will also ensure paid media support can be focused on where it will drive the best results. Facebook is NOT about reach. And it’s also not about engagement. It’s about quality of engagement. 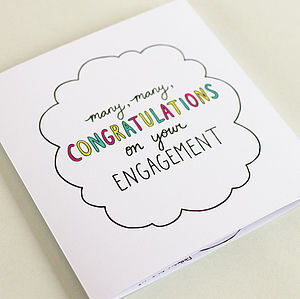 Next time your community manager talks about engagement rates, ask how ‘engagement’ is being calculated. Facebook only counts likes, comments as shares as engagement – leaving ‘other clicks’ on photos, links and update expansions out of the equation. And for very good reason. So it’s goodbye to fan gating. And good riddance I say. I often hear people complaining about low organic reach and how only the most engaged fans can be reached without using paid media support. So organic reach is your most engaged fans, but it is also so much more. Because it also include anyone who sees your content because it has been shared with them – most likely by one of your engaged fans. This means organic reach is actually made up of two different audiences – your most engaged fans, and their friends – which puts a whole new perspective on how you define audiences on Facebook. Your page actually has five different audiences, only two of which can be reached organically. 1. Engaged Fans: these are people who regularly engage with you. 2. Friends of Engaged Fans: people who frequently see your content, and interact with it, because it is shared with them by an engaged fan. 3. 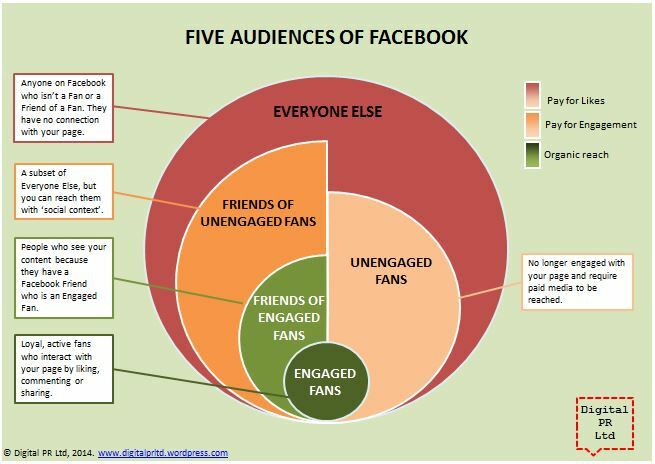 Unengaged Fans: these people like your page but through lack of engagement no longer see any content from you. 5. Everyone Else: this group may be in your target audience, but have no connection with your page. Pages that use competitions to grow their fanbases often have a higher proportion of Unengaged Fans than those that build a following through the quality of their content . If you are happy with your engagement rate but want more people to engage, then use paid media to extend reach to Fans and Friends of Fans. Leverage ads with social context by targeting Friends of Fans. Facebook tells you which of your friends already like that page regardless of how engaged they are with it. Target Everyone Else, but use targeting features to narrow it down to those most likely to engage with your page. Supporting your page doesn’t have to cost a lot if you put some thought into which pieces of content to promote to which audience, and use some of the tips and tricks discussed in my last blog post to use the halo effect from paid advertising to your advantage. It’s a question every page manager gets asked, and one that seems to have a few different answers. Facebook Analytics provides engagement rates for individual posts, but it’s harder for page managers to understand total engagement across their Facebook page over a particular period of time. Understanding total engagement is important. It enables page managers to set benchmarks, compare one content strategy to another, and most critically to provide high level reporting back to key stakeholders. So why does Facebook not provide this metric? Probably because they know page managers will fixate on that one number when a range of variables are needed to determine engagement and overall page performance. 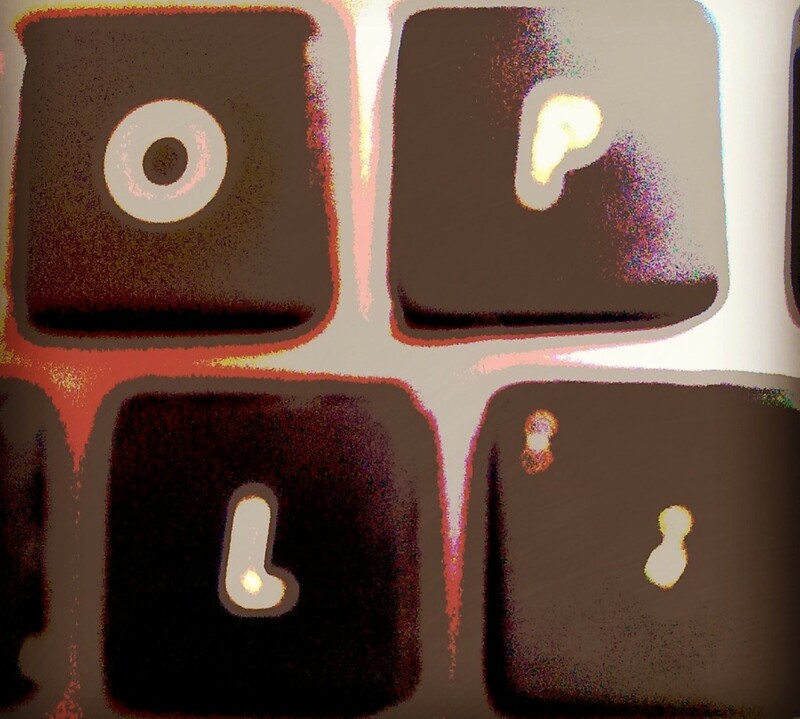 Note that ‘other clicks’ aren’t taken into account – for good reason. While these are a form of interaction, they are easy to fudge. Just post a non-standard sized image with small copy which people need to click to enlarge and voila – awesome engagement rate. Organic posts often deliver the best engagement rate because Facebook’s algorithm ensures they are seen by people who are most likely to engage. But because this is often a small group of people, the number of people reached and interactions delivered are often low. Posts that are supported by paid media can deliver lower engagement rates because they are being pushed out to a wider, but less engaged audience. However the number of people they reach, and the number of likes, comments and shares they attract can be higher. If you’ve been spending heavily on media this month, then your average engagement rate might be lower than normal, but the total number of people reached and people who engaged will be higher. Ensuring you report all three of these numbers together makes it a lot easier to explain this to key stakeholders and clients. Working out engagement across an entire page over a specific timeframe isn’t quite so clear cut. How an overall engagement rate is calculated depends on what you need to report back on – and how much time you have as it’s likely you will need to calculate this manually using the downloadable excel report. Some methods for calculating engagement, and their pros and cons, are outlined below. Total Engagement. The simplest method is to take the way Facebook calculates engagement on individual posts and extrapolate this for your page as a whole. Using data for a specific time period – a week, a month, a quarter – allows benchmarks to be set and time periods to be compared. However this engagement rate will be affected by your paid media activity. Pull back on paid media and the engagement rate is likely to increase – but your reach and number of interactions will drop. Spend heavily on paid media and your engagement rate will be lower, but the number of people reached and number of interactions will increase. To ensure context always report an engagement rate alongside actual reach and interaction numbers to provide a more rounded picture. Competitor Benchmarking. Social Bakers recently released a white paper suggesting a formula that uses interactions divided by the size of the fanbase. This formula uses publicly available data so is a useful way of benchmarking your own page against competitors and others in your category. If you get 1,000 interactions, and you have 10,000 fans, your engagement rate is 10%. If you get 1,000 interactions, and you have 10,000 fans but paid media support means your content reached 100,000 people, then your engagement rate is 1%. Engaged Fans. Demand for this metric came after publication of a report back in 2011 from ComScore suggesting on average only 16% of a page’s fans were engaged (ah, those were the days). Just about every page manager was asked to work out how their page fared against this benchmark. Today this metric simply doesn’t exist. While you know how many fans you have, you can’t tell how many have been reached because ‘Organic Reach’ includes both fans and non-fans. While it seems like such a fundamental metric, knowing how engaged your fanbase is really isn’t that important. This is because the friends of your most active fans are, by default, part of your community – they will see your content because one of their Facebook friends has interacted with it or shared it with them. Facebook have always made it clear that it’s not about your fans, it’s about the total reach you can achieve through your fanbase and the way Analytics is presented reflects this. Don’t use percentages in isolation – always use actual numbers to provide context. Choose a methodology and stick to it – there may be issues with the methodology you choose, but at the very least you will be creating benchmarks and comparing apples with apples.